Hello Internet, I am sorry I was so late to speak with you this week. I have not forgotten you, but my time has been short. James and I could not really decide on a theme for session #4, so we made an eclectic collection of drinks exploring various ideas. Shake over ice and double-strain into a coupe glass. 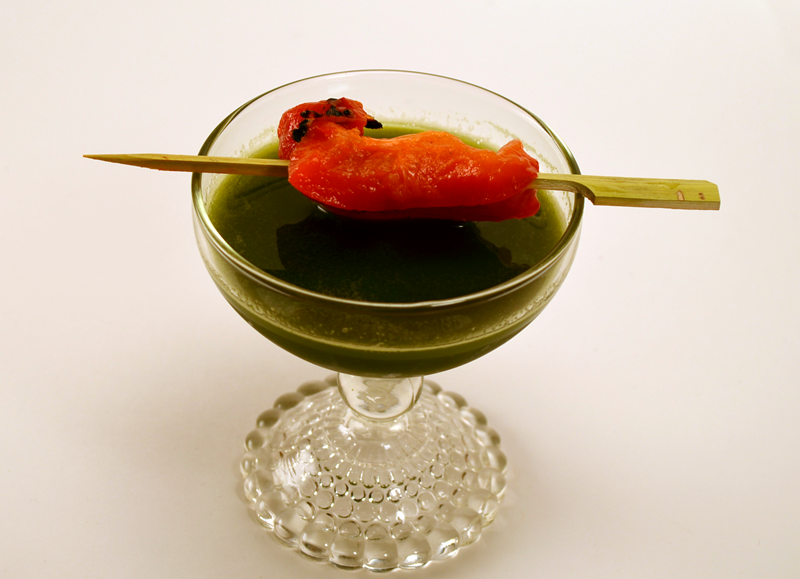 Garnish with a skewered roasted red pepper. Now I know what you’re thinking; “Darnit guys, couldn’t you just stir up a base spirit with some vermouth, maybe add a dash of absinthe or something? Spinach juice, really?” Spinach juice actually has a very mild flavor, and with the little bit of orgeat + vinegar, this really did taste like I was drinking a fancy salad. It was grassy, tangy, sweet, and fruity. Slivered almonds might also have been nice. Categories: modern drinks | Tags: alcohol, almond, balsamic, bartending, booze, cocktail, cocktails, craft bartending, craft cocktails, drinking, drinks, gin, juice, liquor, spinach, spirits, strawberry, vinegar | Permalink. This looks ridiculous, but also potentially good. I will be sure to try it next time I have some spinach juice handy.